Russian President Vladimir Putin’s handling of the crisis in Ukraine has met with considerable opposition in Western nations and much of the international community, as well as in Ukraine itself, but Russians have largely rallied around their leader. Putin is overwhelmingly popular, and Russian national pride appears to be on the rise. In fact, a plurality thinks Putin’s handling of the crisis has improved Russia’s international stature. A large majority of Russians believe the recent referendum in Crimea was free and fair, and that Kyiv (Kiev) should accept the results and allow Crimea to join Russia. Crimea is only one of Russia’s territorial grievances, and as they have in previous surveys, a majority of Russians say they believe there are parts of neighboring countries that really belong to Russia. Meanwhile, tensions with the West have led to a dramatic spike in negative views about the U.S. and the European Union. Similarly, both U.S. President Barack Obama and German Chancellor Angela Merkel are held in low regard. Roughly eight-in-ten Russians (83%) say they have confidence in President Putin to do the right thing in world affairs, up from 69% in 2012, the last time this question was asked. Fully 52% say they have a lot of confidence in the Russian leader, compared with 37% two years ago. 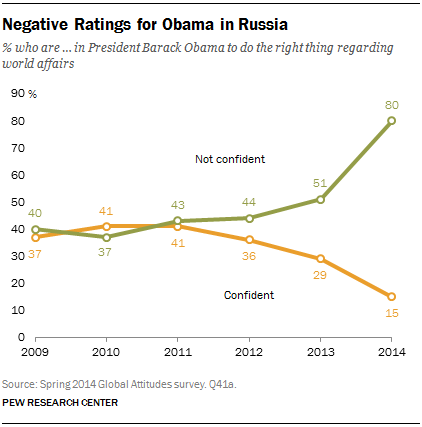 However, Putin has received similarly high ratings before. For instance, in 2008, when Putin was nearing the end of his second term as president, his ratings were nearly identical – 83% said they had confidence in him and 53% expressed a lot of confidence. Few in the international community have recognized the legitimacy of the March 16th referendum in which Crimeans voted to leave Ukraine and join Russia. Russians, however, see the issue very differently. More than eight-in-ten (84%) say the referendum was free and fair. 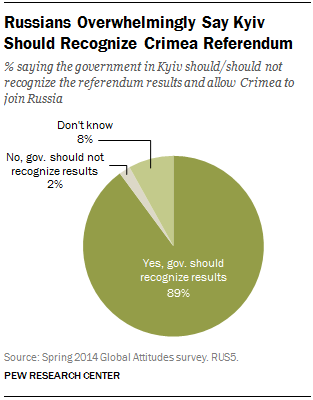 And roughly nine-in-ten (89%) think the Ukrainian government in Kyiv should recognize the results and allow Crimea to join Russia. Throughout the crisis, many in the Russian government and media have expressed concern about the treatment of Russian minorities within Ukraine. (The Ukrainian government strongly disputes allegations of mistreatment). The survey findings suggest most Russians agree with the Kremlin’s criticisms: nearly three-in-four Russians (73%) say the government in Kyiv does not respect the personal freedoms of its people. A 43%-plurality of Russians say that President Putin’s handling of the situation in Ukraine has led people in other countries to have a more positive opinion of Russia. Just 26% believe the way Putin has handled the crisis has led people in other nations to have a less favorable view. Another 22% say there has been no impact on Russia’s international image. Russians’ views of their own country have become more positive over the last year. Roughly half (51%) now have a very favorable opinion of their homeland, compared with 29% in 2013. Russian views about how their government treats its citizens are now also largely positive – 57% say the government respects the personal freedoms of its people, while 32% believe it does not. This is a significant change from 2008, when the public was essentially divided, with 45% saying the Russian government respected the rights of its people, and 44% saying it did not. The Russian military receives overwhelmingly positive ratings. Nearly eight-in-ten Russians (78%) say the military is having a good influence on the country. A dozen years ago, when the Pew Research Center first asked this question, views were more mixed – at that time, 53% described the military’s impact as positive, while 34% said it was negative. Almost two-thirds of Russians (65%) say that military force is sometimes necessary to maintain order in the world. Just 29% disagree with this view. This is a notable change from 2011, when 52% agreed force was sometimes necessary, while 38% disagreed with this position. In the past, Vladimir Putin has described the collapse of the Soviet Union as a “catastrophe,” and many Russians seem to concur. A 55%-majority agree with the statement: “It is a great misfortune that the Soviet Union no longer exists.” Views on this question have been relatively steady since Pew Research first asked it five years ago. 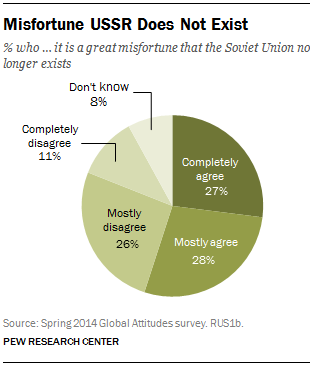 In 2009, 58% described the collapse of the USSR as a great misfortune, and 50% expressed this opinion in 2011. Nostalgia for the Soviet era is particularly common among older Russians. About seven-in-ten Russians age 50 and older (71%) characterize the end of the Soviet Union as a great misfortune, compared with 46% of people ages 30 to 49 and 40% of those under 30. The dissolution of the Soviet Union led to a redrawing of political maps throughout the former Eastern Bloc, and Russians clearly believe that parts of their country were unfairly lost in the process. Roughly six-in-ten (61%) agree with the statement “There are parts of neighboring countries that really belong to us.” Only 28% disagree. Views on this question have remained largely consistent since 2002. However, results were quite different in the early 1990s, as the Soviet empire dissolved. For instance, in a fall 1992 poll, conducted by the Times Mirror Center for the People & the Press less than a year after the Soviet Union’s demise, just 36% agreed that parts of neighboring countries belonged to Russia while 26% disagreed. Nearly four-in-ten (37%) offered no opinion. Interestingly, 48% of Russians believe areas of Russia that wish to secede should be allowed to do so, while only 39% say such regions should not be allowed to break away. Urban respondents (52%) are somewhat more likely than those in rural areas (38%) to think regions should be allowed to secede. Russian opinions of the U.S. are at their lowest point since Pew Research began polling in Russia 12 years ago. Only 23% give the U.S. a favorable rating, down sharply from 51% last year. Previously, the lowest favorability rating for the U.S. was 37%, registered in May 2003, shortly after the start of the Iraq war, when ratings for the U.S. were at a nadir in many countries. Attitudes toward the U.S. are slightly more positive among people under 30 (29% favorable) than among those age 50 and older (19%). Still, even among 18-29 year-olds, a solid majority (64%) express an unfavorable opinion. Ratings for President Obama are also negative. 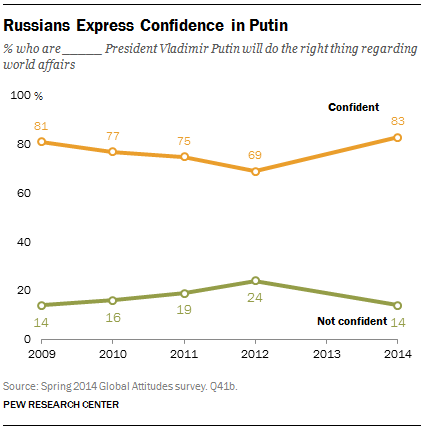 Only 15% of Russians say they have confidence in the American leader to do the right thing in world affairs. Eight-in-ten lack confidence in Obama, up from 51% last year and 44% in 2012. Attitudes toward the EU have also turned sharply negative. 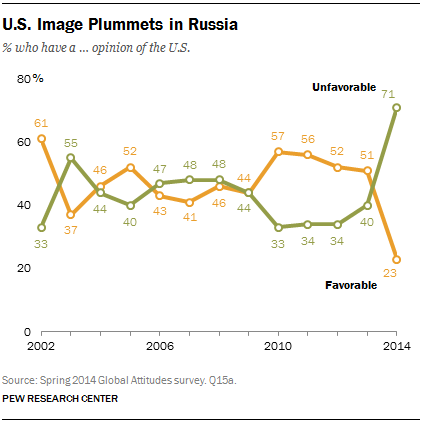 Only 39% of Russians express a favorable opinion of the institution, down from 64% in 2011. Ratings for Germany have also declined. About half of Russians (53%) still have a favorable opinion of Germany, but this is down from the 78% registered in 2011. Just 31% say they are confident German Chancellor Angela Merkel will do the right thing in world affairs, compared with 48% in 2012.